Every time I see this image come up, I wince a little internally. It's not that I don't get what the creator is going for--I totally understand. The paranormal field is a field with few absolutes or constants. One cannot be an expert or a professional in a field that specializes in subject matter that by very definition cannot be proven to even exist. 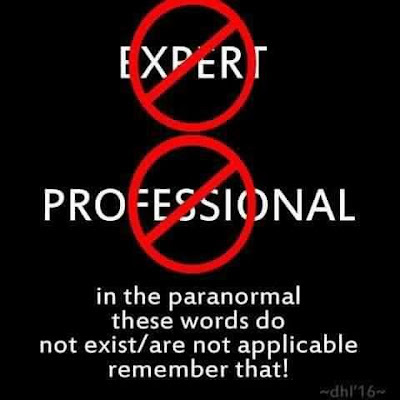 And, as such, there can be no real governing bodies regulating and licensing paranormal investigators/ghost hunters. Aside from a few schools left that offer parapsychology degrees, one cannot obtain an accredited degree in chasing ghosts. And that's a very big but....whether or not its intentional, this particular image represents to me personally much of what is wrong with the paranormal investigation field. We are never going to take this study beyond the fringe sciences with a mindset like this. This field will never be taken seriously until we acknowledge that 'expert' and 'professional' ARE words that are extremely applicable in this field! The study of the paranormal is a broad subject, and even a more specific subset of that topic, such as afterlife study or afterlife communications (ie, ghost hunting), requires a multi-disciplinary approach. Researchers and investigators need to have a good working knowledge of topics such as history, photography, and of course, ALL of the sciences. These are all fields in which there ARE experts and there ARE professionals. When someone asks me about what type of field they should study in college to prepare for a 'career' in the paranormal, I always encourage them to study whatever it is they love---because just about any field you can study can be an asset to paranormal investigation. And, with a proper education, excellent experience, and being well-read, you CAN be an expert and you CAN be a professional in these areas. 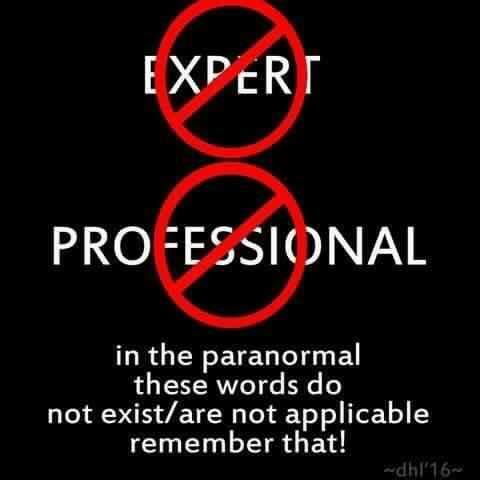 Realistically, though, not everyone can be an expert in their chosen field and NO ONE can be an expert in every sub-field that makes up the paranormal investigation field. That's why its important to know how to network. For example, if you don't feel like your photography skills are up to par, find an expert in that field to examine any anomalous photos you might have. Just make sure to check out their credentials, fully. Your cousin who bought a fancy DSLR camera and takes pictures on the weekends is NOT a photography expert. He might be knowledgeable and even well read. He may even be able to help you out. But, without certain education and experience, he probably isn't an expert. Just keep that in mind before making any outrageous claims. Taking it a step further, this image perpetuates the belief that paranormal research should never go beyond the fringe, and that I don't agree with. There is this widespread acceptance right now that anyone can investigate paranormal claims and be involved in paranormal research. I totally disagree---just cruising around the web, I see so many examples of people who absolutely have no business being in this field. These people do more harm than good to the field, spreading poor, incorrect or misleading information and partaking in investigations where they are more likely to just scare the crap out of their client than to provide any insight or answers. We don't allow just anyone to practice medicine...so why should we allow just anyone to enter a private residence and try to communicate with the dead? Well, I guess the answer is probably because what we do isn't considered a science, lol. But, within my lifetime, I'd like to see that changed. I'd like to see stricter guidelines and governing bodies in charge of paranormal investigators. I'd like to see increased educational standards and accredited places of learning. I'd like to see researchers and investigators with a healthy dose of common sense being properly trained and presenting themselves in a manner fitting a professional. Maybe then, we can finally do away with graphics like this one. We probably won't have as many paranormal researchers and investigators as we do now, but the idea of quality over quantity has always been MY mantra. Happy Haunting!